Wario has dropped buckets on the heads of Mario, Peach and Yoshi. Blinded, they stumble around. You play as a fairy named Wanda, controlled using the SNES Mouse, to guide the blinded heroes to Luigi. Wanda can use her magic wand to make blocks appear and to make Mario and friends change direction. 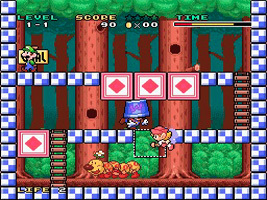 As you progress through the stages, different kinds of blocks appear, such as Timer Blocks that vanish after a short while. Collect the stars that can be found in out-of-reach places for bonus points, and attack Wario's biplane during the bonus stages for Coins.